A COMPLAINT BY Direct Democracy Ireland that one of its founders Ben Gilroy was unfairly treated in an interview broadcast on LMFM has been rejected by Broadcasting Authority of Ireland (BAI). The complaint related to an interview broadcast in July after protesters had forced the cancellation of the Allsop distressed property auction at the Shelbourne Hotel in Dublin. The complaint was submitted by Jeffrey Rudd on behalf of Louth Direct Democracy Ireland who said that, as part of the show the presenter played audio attributed to Gilroy from two years previous which gave a a false impression to listeners that the audio was from the auction. It it should not have come as a surprise to anyone that the xenophobic treatment of staff working at a lawful property sale would be questioned in an interview with somebody who was associated with the protest. LMFM said that during the course of the interview Gilroy was given the opportunity to say that he had not seen any evidence of racist chants and that “he stated that neither he nor any of the members of Direct Democracy Ireland would behave in such a way”. You’re acting like vultures around the carcasses of Irish people’s lives here with your fine British accent. I think you should go back to England and stop selling Irish properties. The BAI rejected the complaints on a number of grounds. 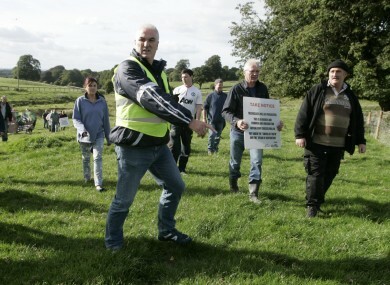 They said that it was entirely appropriate that Gilroy be questioned about the role of this organisation as well as his own involvement in the protest in the context of the auction and the events leading to its cancellation. The committee noted that Gilroy was the only interviewee and was given ample opportunity and time to address the issue of xenophobic comments alleged to have been stated at the protest, including questions as to whether he endorsed such comments and whether they were appropriate. In relation to the the YouTube clip that was aired during the show, the BAI decided that as the clip was in the public domain it was legitimate to use and at no point the the presenter suggest that it was from video was from the recently cancelled auction. Email “BAI reject complaint by Direct Democracy Ireland alleging unfair treatment”. Feedback on “BAI reject complaint by Direct Democracy Ireland alleging unfair treatment”.